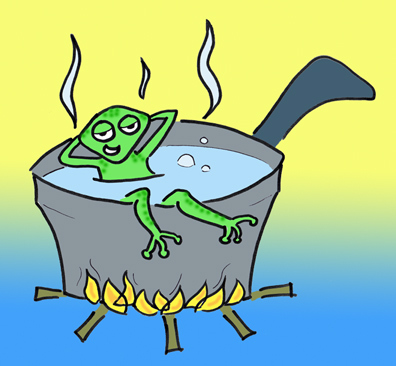 If we put a frog in a vessel of water and start heating the water. As the temperature of the water rises, the frog will adjust its body temperature accordingly. The frog keeps on adjusting with increase in the temperature. It is only when the temperature reaches the boiling point the frog will not able to adjust it any more. At that point the frog decides to jump out but unable to do so, because it has lost all its strength in adjusting with the rising water temperature. Very soon the frog dies. The question here is what killed the frog? Many of us would say the boiling water, but the truth is the frog's inability to decide when it is the right time to jump out. We all need to adjust with people, situations, challenges of life. The inability to take the decision and follow the decision while it is not too late is the crucial aspect in life for success. We have to decide when to jump. Let us jump while we still have the strength. We tend to be politically correct and contextualize with the gospel to the extend of compromising the essence of the gospel. In one of my recent conversation with a graduate from a christian university in Ohio with a bachelors' degree in religious studies mentioned to me his experience in the class room. He said he was taught hinduism by a hindu practicing believer, islam and buddhism the same way. When it comes to christianity the professor in a christian college is not willing to profess his or her faith and only interested in deconstructing the gospel or biblical text without sharing the essence of the gospel. As I thought about the above illustration for a while, there is a great lesson to learn. I have talked with a lot of people who are addicted to some substance in their life as part my counseling intervention. One thing I noticed in the repeated statement from my clients is that: "When I started using it I thought I will never depend on any substance and thought I had the power to overcome and I am in control, but today I am controlled by the chemicals. Taking calculated risk in life is very important for success. Who you are tomorrow begins with what risk you take today. Invest in yourself when you are young. Death is the only one guarantee in life and everything else involves risk. Most of the time we are afraid about the consequences of the risk involved with our decisions. In the behavioral and positive psychology we talk a lot about systematic desensitization. It is a diminished emotional responsiveness to a negative stimulus after repeated exposure. In the modern self-help world we say "fake it until you make it." In the Gospel of Mathew (25: 14-30) we have a wonderful account about a man going for a journey who called his servants and entrusted to them his property. To the one he gave five talents, to another two and to another one. The gospel clearly says the master gave it according to the ability. Finally the one who received one talent went and dig the ground and hid his master's money. Finally the tragedy happened and cast the worthless servant into the outer darkness. When Christ call us for His glorious ministry He is inviting us to take a step of faith which involves risk and to stay out of our comfort zone. A turtle never move forward until it put its neck out. Risk is not one of the virtues in life but the testing point in every corner in life. It is impossible said pride. It is risky said experience. It is pointless said reason. Give it a try whispered the innermost self. What voice will you listen today. Take enough risk today and be willing to enjoy the fruit of it rest of your life. I Invite your comments and feed back.